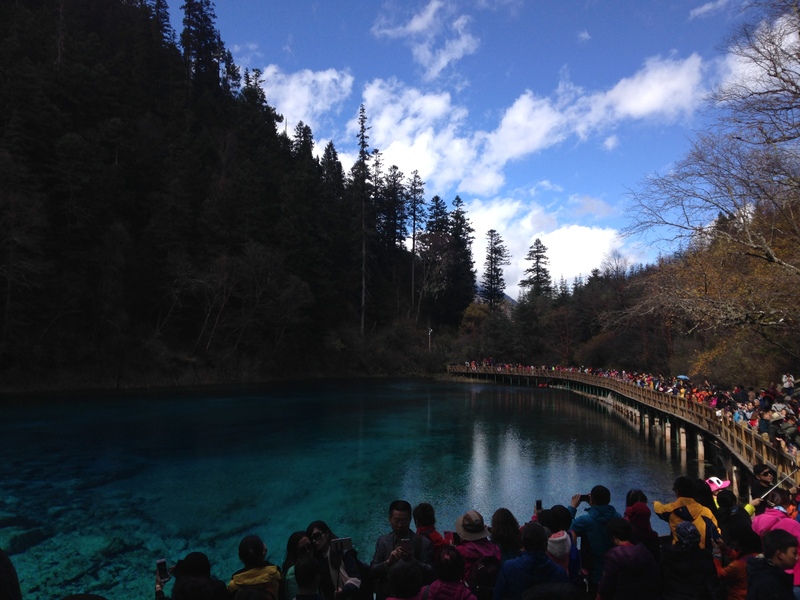 Last weekend we took off work and decided to take the Universities offer of a trip to Jiuzhaigou ( 九寨沟 ). I have been there around 2 years ago, but I’ve always wanted to return. It’s such a beautiful place! We left on the Friday, departing from the school at the ungodly hour of 6:30am, and driving North. 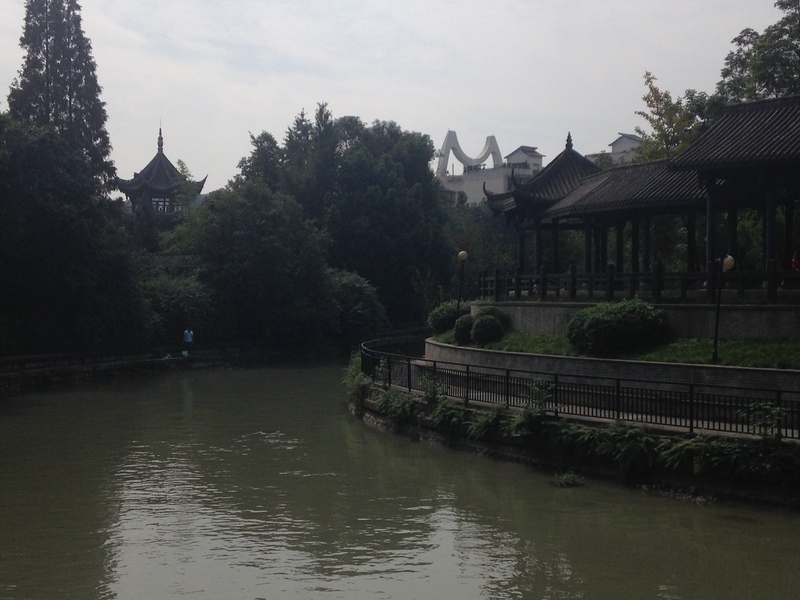 We had lunch, which wasn’t particularly tasty, and at about 4:00pm we arrived at Huang Long. 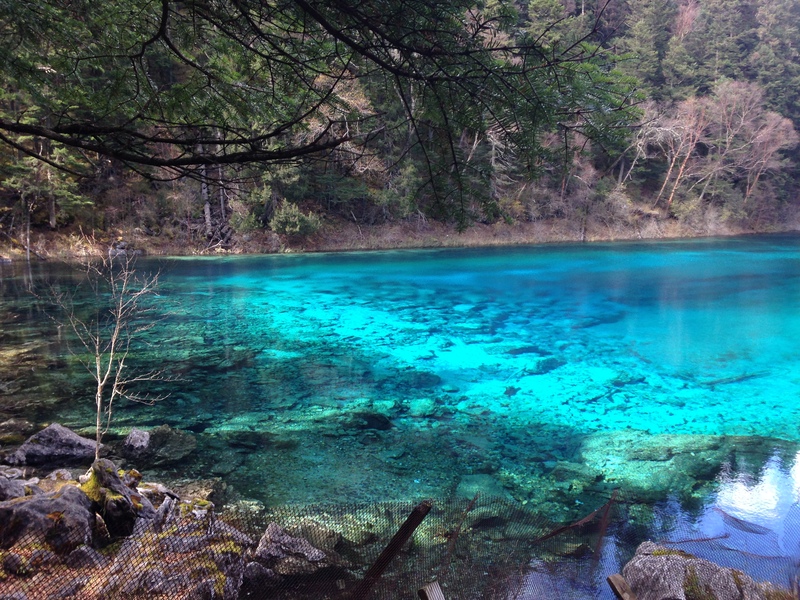 This is a beautiful area that many people visit as it’s on the way to Jiuzhaigou. Of course though, this is China, and nothing ever runs smoothly here. We were told by our tour guide that we would only have 1 hour at the park. 1 hour!?! To walk to the top takes at least 30 minutes! They told us we could get the cable car up, then walk back down again. We decided against this idea, we wouldn’t have time to make it back down to the exit in one hour. So, we decided to go to the main entrance and walk the opposite way up the mountain. But just as we entered, the guide said ‘You can stay 2 hours in the park’. But….. why tell us this NOW? While we just enter? With this new announcement we became rather annoyed; we could have taken the cable car after all, and see the most beautiful area that is up at the top of the mountain. But never the less, we couldn’t do anything about it now. So we started walking. 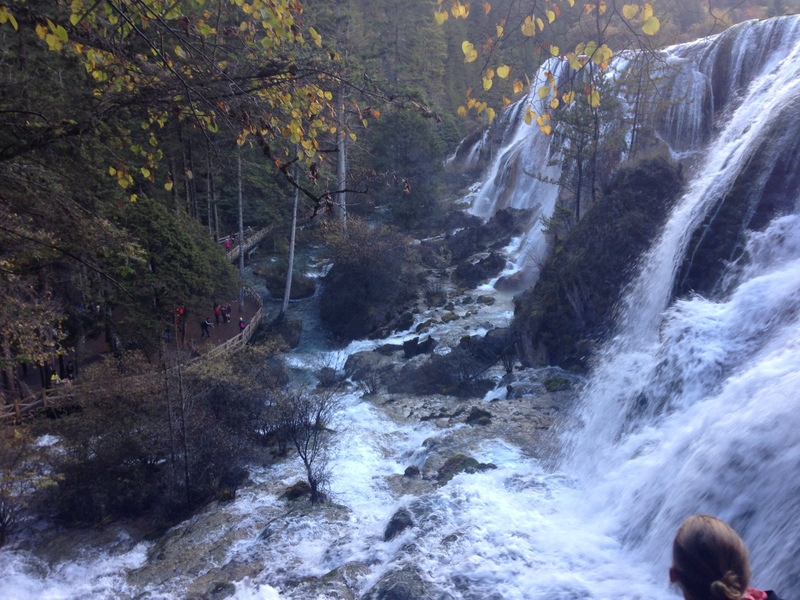 As everyone was coming down, we were walking up; so we were literally walking against the tide of Chinese people! We walked about 40 minutes and took some lovely photos until it started raining. Clouds started rolling in and then we heard thunder followed by lightening! Up on a mountain, surrounded by water; this wasn’t a very good combination. We quickly started to head back down. This was also the Chinese peoples idea too, so we were all rushing past one another to get down before the rain got worse. 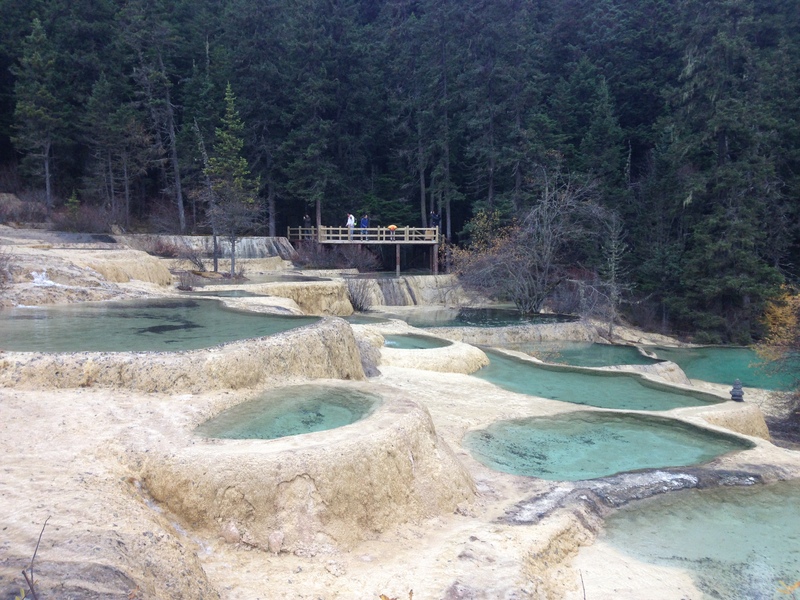 By the time we got to the exit, my trousers and feet were soaked, but we were the lucky ones. The others, who got the cable car, spent another half hour getting down the mountain. By this time it was dark, so god knows how they managed it! Because we had to wait for the other people, we ended up getting to our hotel at around 11pm! We were supposed to have dinner by 8pm there. I was dubious about the food… ‘would they have food waiting for us at such a late time?’ ‘Would the cooks actually wait for us to return to cook it?’….. We arrived, and the food was out, presumably since 8pm. It was serve yourself, so I’m guessing they just left the food there. One look of it and I decided against it, having a small bowl of luke warm rice. Then we went to bed. On Saturday, we left the hotel at the more reasonable time of 7:30am. Well, it was SUPPOSED to be 7:30, but by the time everyone was out it was 8:00am when we left. 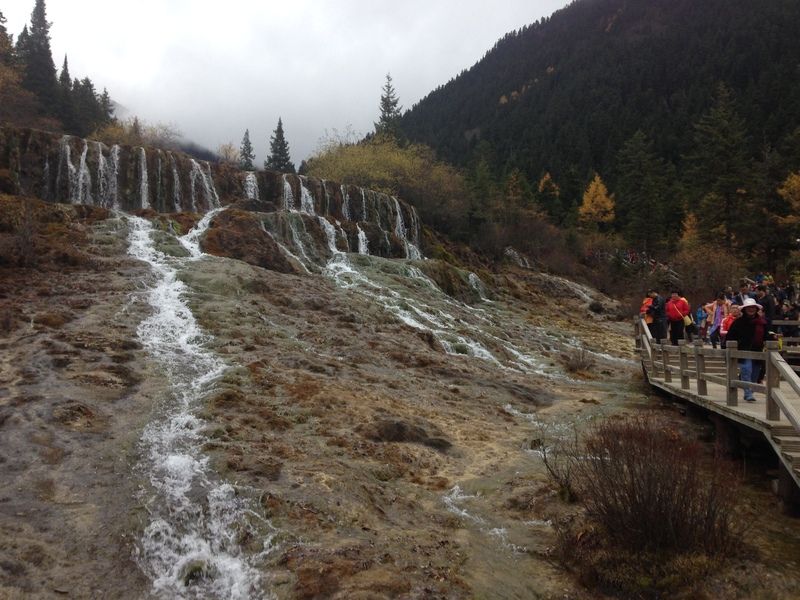 We entered Jiuzhaigou park at about 10 and spent the whole day walking and enjoying the scenery. We strolled around with a few others that we met on our bus. 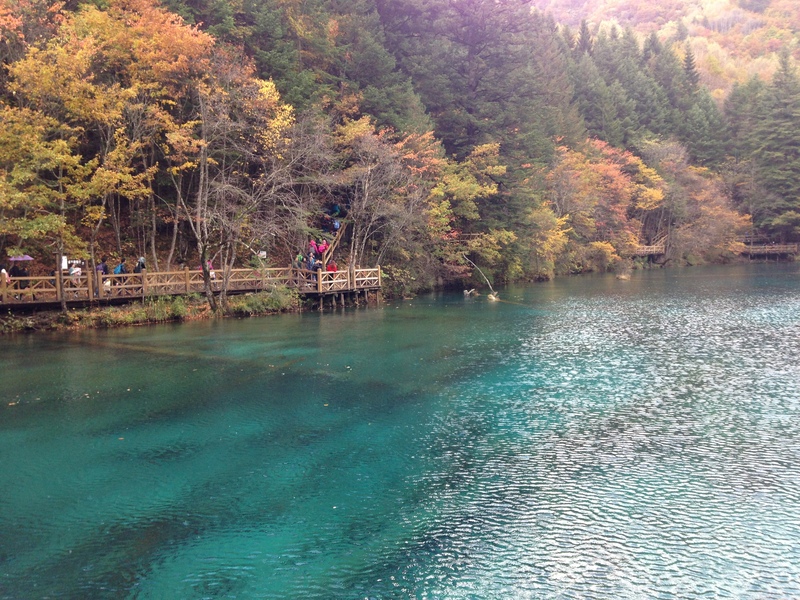 Although it is a long trip, I think It’s worth it; the beautiful surroundings, the crystal clear water, and they preserve it well. One thing I did notice since my last trip; selfie sticks!! 2 years ago I don’t think they existed; I remember loads of people holding iPads. Now, iPads are gone and selfie sticks are in. And by god they were everywhere! They were actually pretty annoying, as they are so long which makes it difficult to get past someone with one. 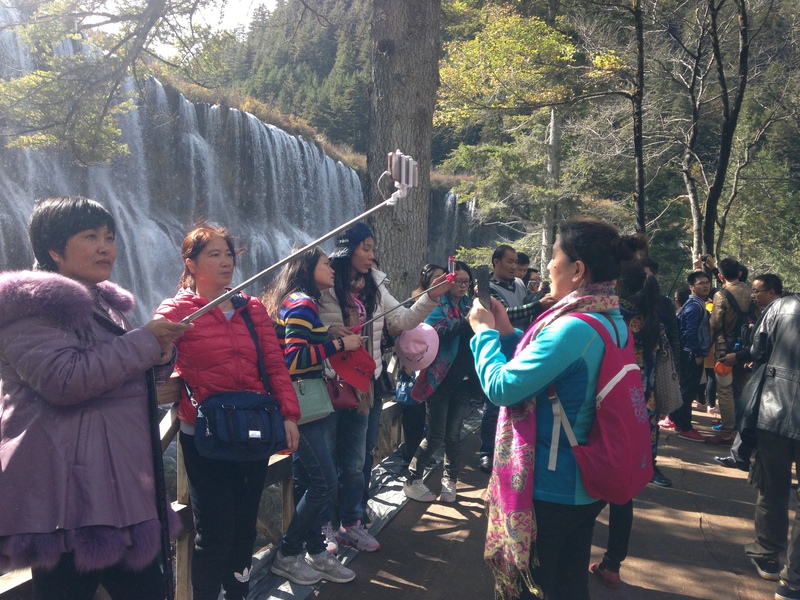 The Chinese do love their selfies. I understand why many institutions banned them though. So after Jiuzhaigou, we got the bus back to our hotel, where the ‘lovely’ food was waiting (presumably about 3 hours) for us. Deciding against eating this, we got some food prior to leaving the park, so we were quite full. We didn’t venture near the restaurant and instead went straight to bed, having to leave at 6:30am the next day. Sunday was travel day, and it was long, and windy! 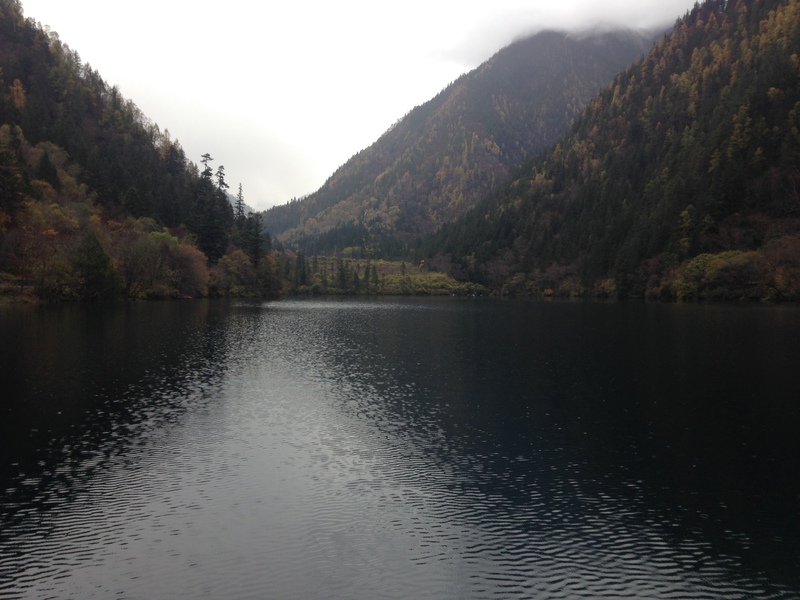 We were to drive south, all the way back to Chengdu. The driver had another idea, deciding to turn east. From the main road we turned into a road barely large enough to fit two cars either side. I checked my map and was surprised to see he was driving in a different direction. But we carried on; the road twisting and turning up a mountain. All I saw were trucks, presumably heading to a quarry or something. This made me nervous. Every turn I expected would lead to a dead end. I text my friend who was on the other bus and asked him was he on the same road. He text me back with his location. They were NEARLY home!! Whereas we were in the middle of nowhere. They kept on the main road. I was thinking ‘why the hell is our driver going this way? ?’ By this stage, most people on my bus were wondering what was going on. Apparently our driver heard that the main road was closed, and this road was the only way back. I got another message from my friend at 5pm ’I’m home now’. I was definitely not saying ‘I’m home’. Well away from it in fact. We finally got back at 7pm, but I suppose it was better than 9 or 10pm. 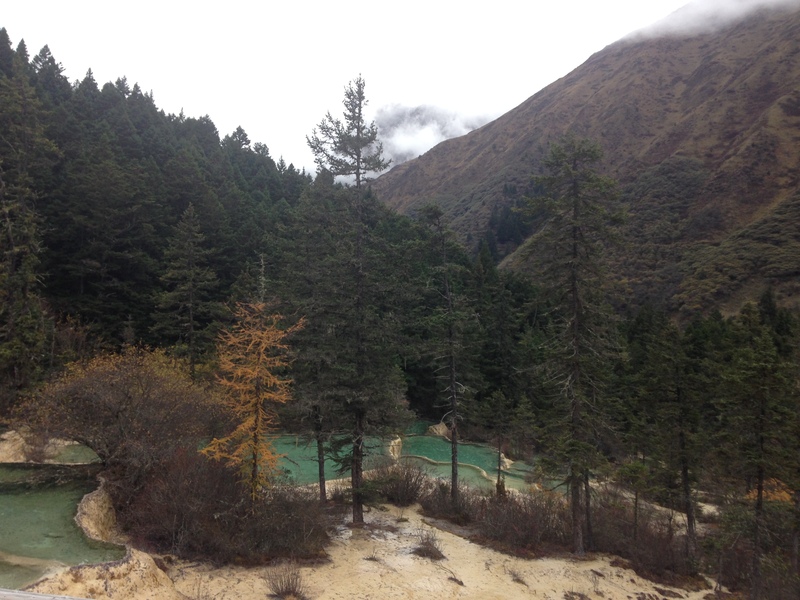 Although I did enjoy the trip, the organisation of it was very bad. We expect this; nothing is organised in China. I’m not exactly sure why, it just is. Every foreigner living in China says the same thing, so now most people expect a trip, or an event to be unorganised. 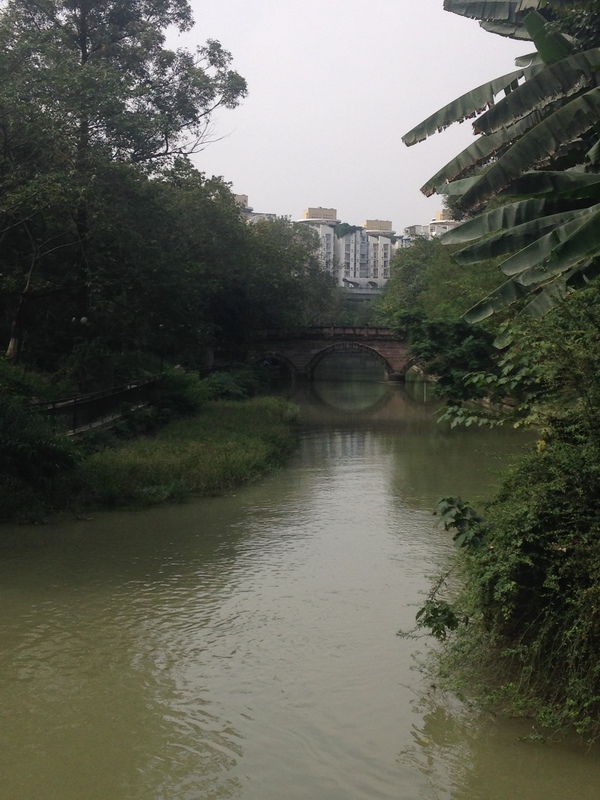 Yet it was great to get away from the pollution and the grey sky of Chengdu. I’ve been getting more and more headaches recently, which I’m blaming on this. And we did plenty of walking which I’m happy about! But…. 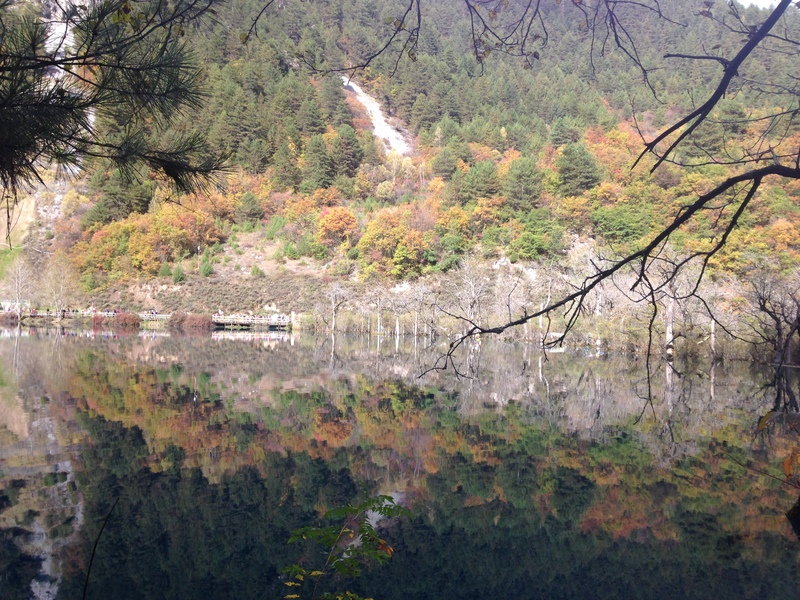 I’m sorry, I cannot travel to Jiuzhaigou by bus, for 10 hours… for the 3rd time! Twice is definitely enough for me. 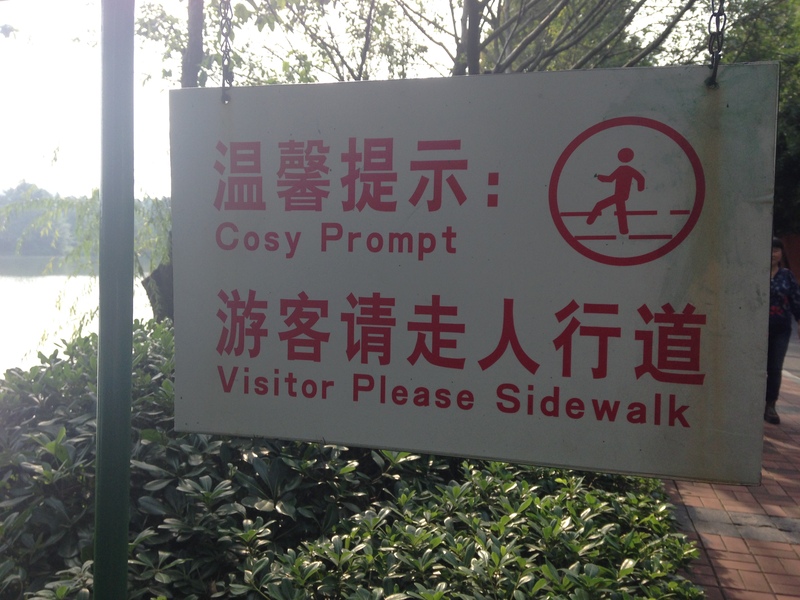 Our favourite park in Chengdu. 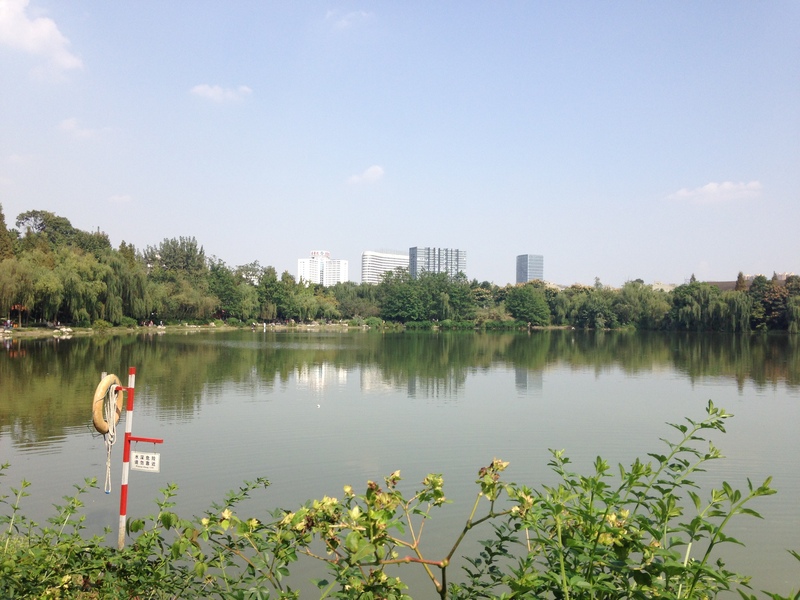 Because last Sunday it was such a nice day, we decided to go our favourite park; Huan huaxi Park. Before this however, we decided to get lunch in one of our usual eating spots while we lived in the old apartment. This is one of the first places Rafa brought me to eat when we were first meeting, so it has good memories for me. Unfortunately we haven’t eaten there since last March, since we left the old place. It is run by the husband and wife, and it isn’t even a restaurant, just an area big enough to fit around 5 tables. We would often see their small grandchild there. At that stage she couldn’t really walk yet. We used to say ‘let’s go and see the baozi baby’. Ha I’m not sure how we ended up with that name, but I think it was because whenever we would see her she would be wrapped up in layers of clothes, literally like a ball. We always joked that if they let her go she would roll away. Baozi’s are steamed buns by the way. The man doesn’t even sell baozi buns! But we ended up calling him ‘baozi man’ too. We would usually get jiaozi’s, and they are very nice! They come with spicy dipping sauce, and so far, we haven’t found another place that sells these. The owners have their own dialect (not sichuan dialect) so we are presuming the jiaozi’s are from that province. It was so nice to see them again. The husband and wife were there, and suddenly we saw the little baby! 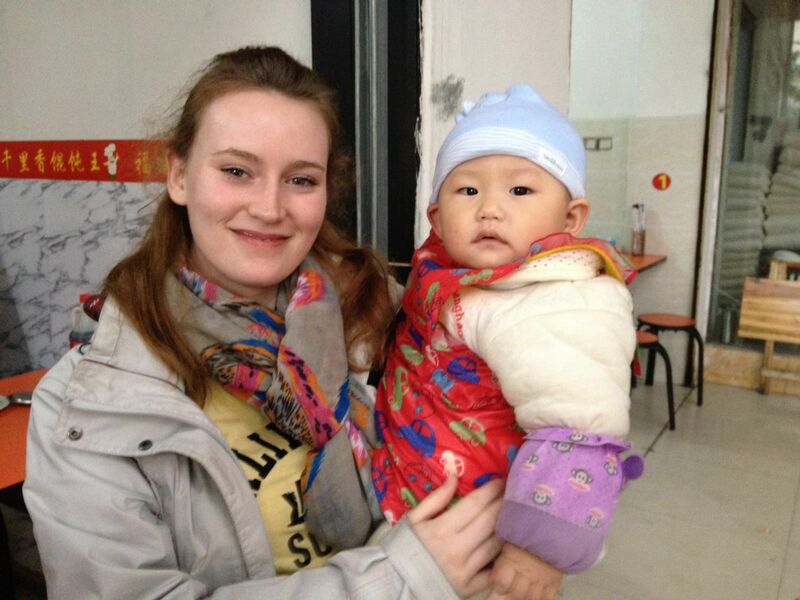 She was much bigger now, and was blabbering a little in Chinese. And, she was no longer afraid of me; giving both of us a wave! After our food, we explained to them that we don’t live near there anymore so thats why we don’t go anymore. But we did promise to ourselves to make sure to go more often. I missed those jiaozi’s and of course the baby. We have a photo of myself holding the baby and we showed it to my family. My little 4 year old nephew asked ‘Is that your baby?’ Then, during our Skype session he would ask ‘where’s your baby that was in the picture?’ Aw kids! 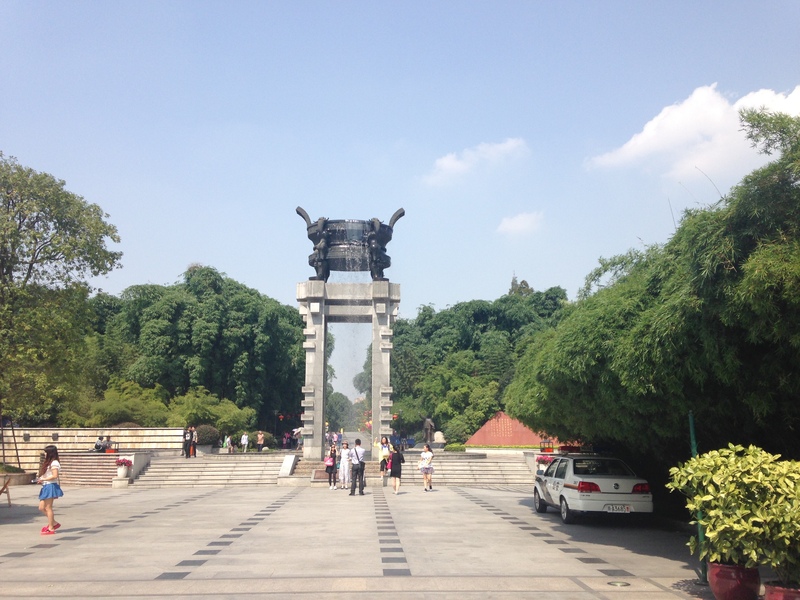 So after our lunch, I decided we could go to Huan huaxi Park which was quite close to where we were. Coincidently the last time we visited was this time last year! So we haven’t been there in a while! 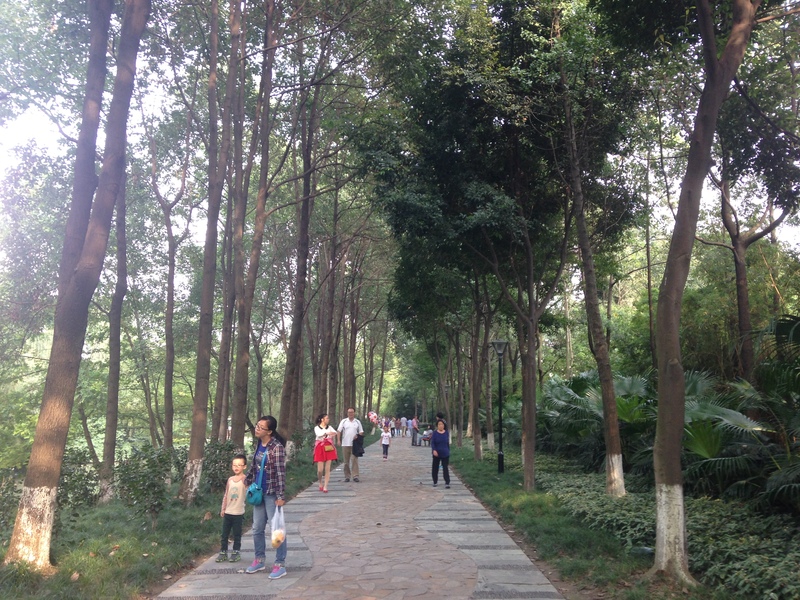 I think the reasons why I love this park is that it’s big, there are bamboo trees everywhere, theres a huge lake to walk around, and it doesn’t feel as cramped as say ‘People’s Park’. Because it’s so big, it doesn’t feel like there are so many people in it. I also like the layout of it. Luckily it was a lovely sunny day, so that added to how nice it was. 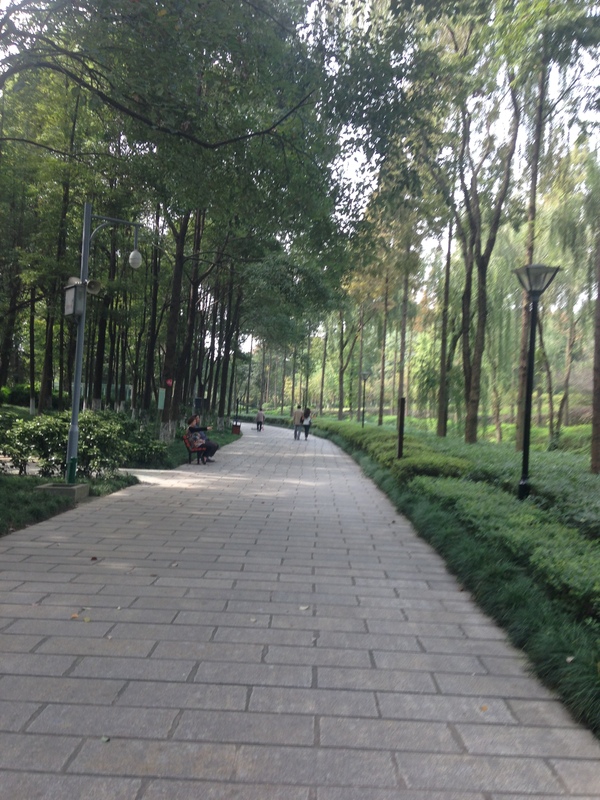 It would be a good place to go running in in the mornings as it’s also free. We decided to get some teas and sit by the river. I wanted to get my red tea 红茶 hong= red, cha= tea, but unfortunately they didn’t have it. That was the only tea I knew in Chinese, so he ended up giving us one that we had tasted before and liked. We sat for over an hour, until my poor feet were covered in mosquito bites. They are still itchy as hell! Then we went for our stroll, taking some videos to send to my family later. 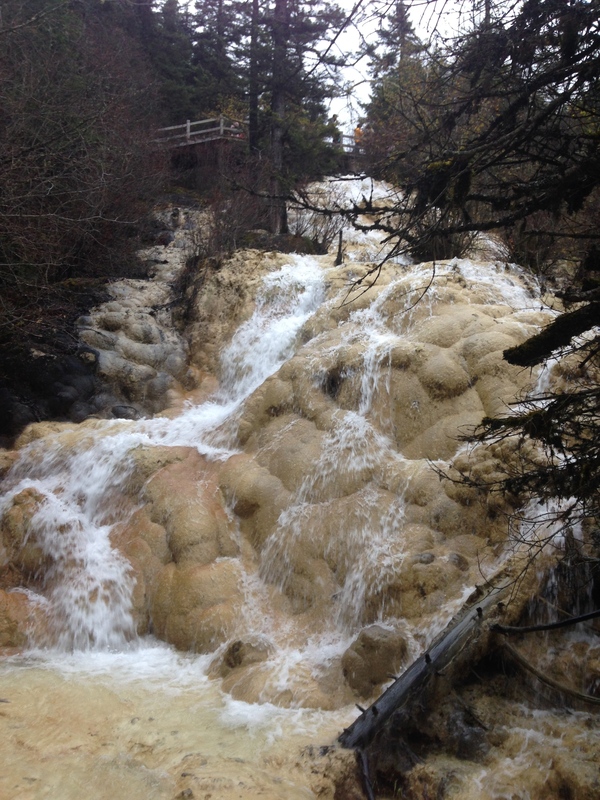 Here are some pictures from the Park. Some of these are from last year. We were on our e-bike driving up to our school at the campus and we hear the sound of someone cutting grass in the complex. The sound, and then as we past, the smell of it immediately transported me back home; my Dad cutting the grass in the garden….usually it’s a good day. The smell wafting up to me. I think this smell is the strongest one that reminds me of home. It’s not often I find someone cutting the grass here, but when I do, it just brings me back home. This particular time was the strongest though. It’s amazing how a smell or a sound brings back memories. I think for me, I grew up with my Dad cutting the grass all the time, meaning it’s a deeply-ingrained memory. Of course there are many more; my sisters perfume or something that my mum cooked. Whenever they send me a box over from Ireland, I take a long smell inside the box; I know it’s Irish air trapped in there! Pure and fresh! When they send me clothes from home, I take a long smell again, reminding me of home. The first box they sent me I asked for my little teddy cat, I didn’t bring it with me. It’s my childhood teddy. The smell of home lingered on it for weeks. I love being reminded of home, but It also makes me miss it! I wonder, when I leave China, what smells with remind me of my time here? Maybe the strong smell of hotpot. (if I ever try a hotpot place in Ireland or somewhere else). I definitely know one thing that I’ll never forget….. STINKY TOFU! I’d never dream of finding it in Ireland, but I’m sure thats one scent that is unique to Chengdu. For Rafa, something that reminds him of home is this spicy salsa sauce you put over food, like in a tortilla wrap. Coming back from Mexico, he brought some back with him. He says smelling that instantly reminds him of home. Another thing is a sauce called ‘Valentino’. It’s red/brown in colour and spicy. We put it over our popcorn. That again is from Mexico and it reminds him of home. Yet for me, those sauces, because I ate them in China, will always remind me of China! 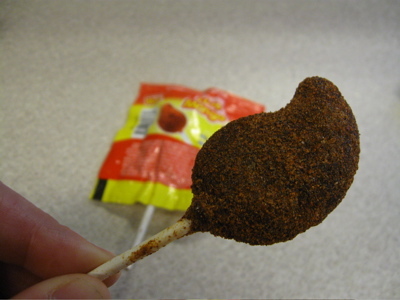 One thing that does bring memories for me of Mexico… While I was there we bought these watermelon flavoured lollipops. On the outside you have kind of like a powder covering them. It is both sour and sweet and for me, a very unique taste that reminds me of Mexico. But, like stinky tofu, there are some smells (which seem plentiful in China) that I’d rather not get used to….. public toilets to name but a few!